Investigative reporting, analysis, and opinion about the California Commission on Judicial Performance and CJP Director Victoria B. Henley. 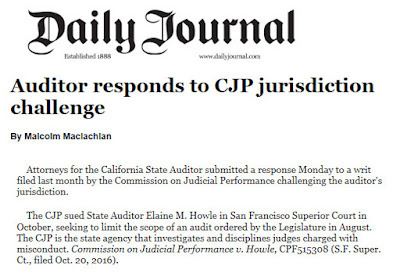 Attorneys for the California State Auditor submitted a response Monday to a writ filed last month by the Commission on Judicial Performance challenging the auditor's jurisdiction. 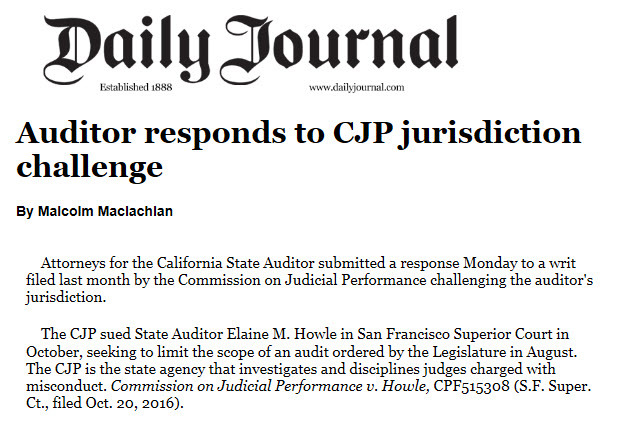 Myron Moskovitz, who represents Howle, said the CJP's arguments seek to sidestop decades of well-established law around the auditor's office and its functions. "This is the first time anyone has ever complained about their right to audit a public agency that gets public money and is supposed to serve the public," explained Moskovitz. "I don't know what they are afraid of." The controversial lawsuit against the auditor was ordered by CJP Director Victoria Henley and reportedly will cost the public north of six figures. Henley is paid $194,000 per year by California taxpayers. The Commission on Judicial Performance, established in 1960, is the independent state agency responsible for investigating complaints of judicial misconduct and judicial incapacity and for disciplining judges, pursuant to article VI, section 18 of the California Constitution. The commission's mandate is to protect the public, enforce rigorous standards of judicial conduct and maintain public confidence in the integrity and independence of the judicial system. While the majority of California's judges are committed to maintaining the high standards expected of the judiciary, an effective method of disciplining judges who engage in misconduct is essential to the functioning of our judicial system. Commission proceedings provide a fair and appropriate mechanism to preserve the integrity of the judicial process. The commission's jurisdiction includes all judges of California's superior courts and the justices of the Court of Appeal and Supreme Court. The commission also has jurisdiction over former judges for conduct prior to retirement or resignation. Additionally, the commission shares authority with the superior courts for the oversight of court commissioners and referees. Victoria Henley, Director-Chief Counsel of the commission, is designated as the Supreme Court's investigator for complaints involving the judges of the State Bar Court. The commission does not have authority over federal judges, judges pro tem or private judges. In addition to its disciplinary function, the commission is responsible for handling judges' applications for disability retirement. The commission's authority is limited to investigating allegations of judicial misconduct and, if warranted, imposing discipline. Judicial misconduct usually involves conduct in conflict with the standards set forth in the Code of Judicial Ethics. The commission cannot change a decision made by any judicial officer; this is a function of the state's appellate courts. After investigation, and in some cases a public hearing, the commission may impose sanctions ranging from confidential discipline to removal from office. Victoria B. Henley, Director-Chief Counsel $194,000; Janice M. Brickley, Legal Advisor to Commissioners $162,00; Bradford L. Battson, Senior Attorney III $133,000; Stephen D. Rockwell, Senior Attorney III $133,000; Sei Shimoguchi, Senior Attorney II $126,000; Mariah Baird, Senior Attorney III $123,00; Valerie L. Marchant, Senior Attorney III $117,00; Cynthia R. Dorfman, Senior Attorney IV $116,000; Sonya R. Smith, Senior Attorney II $107,000; Charlene M. Drummer, Senior Attorney III $106,000; David Lane, Senior Attorney II $94,200; Amy N. Ladine, Supervising Administrative Specialist $94,000; Karen L. Claybroome, Senior Attorney II $80,000; Malissa Thomas, Administrative Assistant to the Legal Advisor $64,800; Khoi N. Bui, Senior Information Technology Specialist $64,700; Alexis Y. Barber, Administrative Assistant to Counsel $64,600; Ronnie B. Moises, Business Services Officer II $63,300; Ester A. Jeung, Secretary to Staff Counsel II $61,700; Ashley L. Sisson, Secretary to Staff Counsel I $52,200; Mary M. Harvey, Secretary to Staff Counsel I $43,800; Anjuli L. Fiedler, Senior Attorney II $29,800; Collette A. Brooks, Senior Attorney III $20,600; Robin S. Hebert, Secretary to Staff Counsel I $3,880; Nancy Gilmore, Supervising Administrative Specialist. Source: Sacramento Bee State Worker Salary Database. 1. What Is the Commission on Judicial Performance? The Commission on Judicial Performance is the independent state agency responsible for investigating complaints of judicial misconduct and for disciplining judicial officers. 2. Over Whom Does the Commission Have Authority? The commission has authority over all active California state court judges and over former judges for conduct while they were active judges. The commission also has authority over court commissioners and referees as explained in Question 10. In addition, Victoria B. Henley the Director-Chief Counsel of the commission is designated as the Supreme Court's investigator for complaints involving State Bar Court judges. 3. Who Can File a Complaint? Any individual or group may file a complaint. The commission has received complaints from litigants, attorneys, jurors, court-watchers, court personnel, prisoners, court administrators, members of the public, judges, legislators, and others. Anyone who has knowledge of possible judicial misconduct may file a complaint. The commission also considers complaints made anonymously and matters it learns of in other ways, such as from news articles or from information received in the course of a commission investigation. 4. What Is Judicial Misconduct? Judicial misconduct usually involves conduct in conflict with the standards set forth in the Code of Judicial Ethics. Some examples of judicial misconduct are rude or abusive demeanor, conflict of interest, abuse of the contempt power, communicating improperly with only one side to a proceeding, delay in decision-making, and commenting on a pending case. Judicial discipline has been categorized according to the Types of Misconduct involved. 5. What Can the Commission Do? The commission investigates complaints of judicial misconduct and, when warranted, imposes discipline. The commission can issue confidential advisory letters, private admonishments, public admonishments and public censures. In the most serious cases, the commission can order that a judge be removed or retired from office, bar a former judge from receiving judicial appointments or assignments, or find that a court commissioner or referee is ineligible to serve as a subordinate judicial officer. 6. Can the Commission Change a Legal Ruling? No. The commission does not have authority to direct a judge to take legal action or to reverse a judge's decision or ruling for judicial error, mistake or other legal grounds. These functions are for the state's appellate courts. Allegations stemming from a judge's rulings or exercise of discretion ordinarily do not provide a basis for commission action, and personal dissatisfaction with a legal ruling is not grounds for investigation of a judge. 7. Can the Commission Help Me with My Case? No. The commission cannot provide legal assistance or advice to individuals or intervene in litigation on behalf of a party. If you need advice or assistance about what to do next concerning your case or if you seek to change the outcome of the case, you should consult a lawyer immediately. Complaints must be submitted in writing. See Filing a Complaint for further information. 9. Are Complaints Treated Confidentially? Under the California Constitution and the rules governing the commission, complaints to the commission and commission investigations are confidential. The commission ordinarily cannot confirm or deny that a complaint has been received or that an investigation is under way. If formal charges are filed, the case becomes public. 10. Can the Commission Handle Complaints About Court Commissioners or Referees? Yes. The commission shares authority with the superior courts to investigate and discipline subordinate judicial officers - attorneys employed by California's state courts to serve as court commissioners and referees. Complaints about court commissioners or referees must first be directed to the presiding judge of the court in which the matter was heard. If you want the commission to review the local court's final action on your complaint against a court commissioner or referee, you must file a written request with the commission within 30 days after the date the notice of the local court's action on the matter was mailed. 11. Does the Commission Handle Complaints About Attorneys? No. Complaints about attorneys should be directed to the State Bar of California. 12. Does the Commission Have Jurisdiction over Temporary Judges? No. Judges pro tem are attorneys temporarily serving as judicial officers. The State Bar of California has jurisdiction over attorneys. Although temporary judges are not employed by the courts, you may wish to bring a complaint about a judge pro tem to the attention of the presiding judge for consideration in making future appointments. 13. Can the Commission Consider Complaints About Private Judges? No. The commission has no authority over former judges serving as private judges. The commission's jurisdiction over former judges is limited to their conduct before retirement. 14. Does the Commission Have Jurisdiction over Retired Judges Sitting on Assignment? No. The commission has jurisdiction over retired judges only for their conduct prior to retirement. The Assigned Judges Program of the Judicial Council has the authority to review complaints about retired judges sitting on assignment.